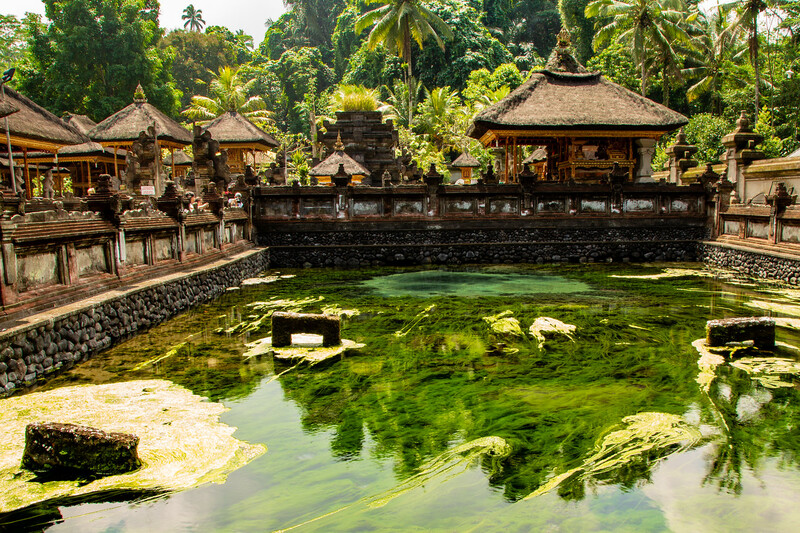 For over a thousand years Balinese Hindu worshipers have been drawn to a mysterious place, that is also one of Bali attractions, the Tirta Empul Temple. 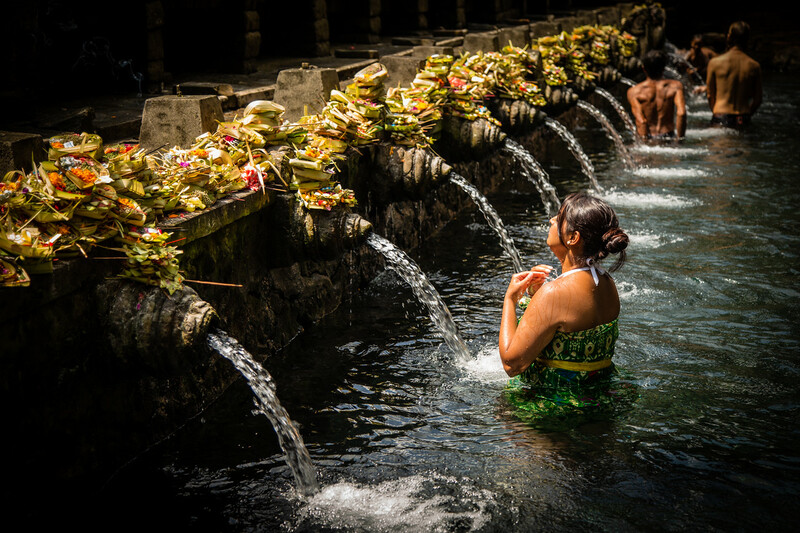 Known to the Balinese as Pura Tirta Empul and more casually as Holy Springs the temple is the site of bubbling freshwater springs that are believed to bring protective blessings and release from illness. 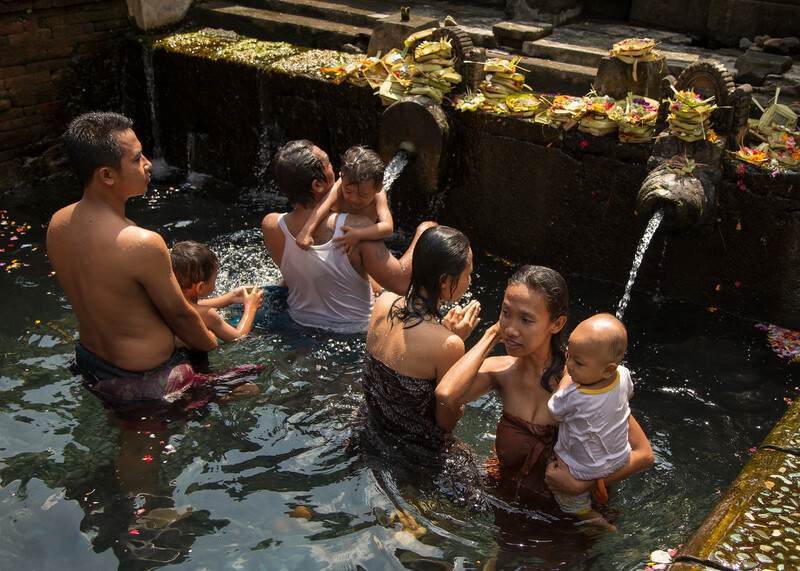 Hindu legend says that the sacred springs were created by the Indra, god of rain and thunderstorms, by piercing the earth, after his forces had been poisoned by King Mayadenawa, to create a fountain of immortality to reinvigorate them. An inscription dates the founding of a temple at the site to 926 AD. It is quite moving to watch as devotees come to soak in the cool water. To me, bathing at the springs appears to be a multi-generational celebration with the pious slowly performing ritual cleansings at each station while young children learned to swim in the clear waters. The best way to get to Tirta Empul Temple is by car or tour bus. It is located close to the town of Tampaksiring, about 30 minutes north of Ubud. Free parking is available at the temple. As with all Balinese temples, you need to dress respectively. No short shorts etc. You will need to wear a sarong to enter the temple complex. If you don’t have a sarong, there are some available to rent at the entrance for a small donation. Stalls selling water, snacks, simple Indonesian dishes and souvenirs are available in the car park. Go early before the tour buses arrive, especially during high season.